This ones totally cute and very vintage feeling! You get to personalized it with the inital of choice. Simple entries for your chance to win, good luck! I just realized it doesn't say whether the giveaway is open worldwide? If not, please delete my entries - thanks! Absolutely drool worthy, thank you! Thanks for the chance, Kelly. It's a beautiful set! Thank you for the giveaway!! I adore your necklaces! super cute items. thanks for the giveaway! I love the necklace, it's too pretty! Beautiful work, PS can I win from canada? Thank you. Your work is just gorgeous. And you're very generous. I think this is one of the most beautiful pieces of jewelry I have ever seen! Love it!!! I love your jewelry!!! You have such beautiful pieces. Thanks for the chance to win this gorgeous necklace and earrings. Have a lovely day!! Dying over that necklace. SOOOO cute. That would make such a good gift...and a good gift for me, toO! hahahaha. I love the necklace. As a stepmom I would be proud to wear the names of my stepkids anyday. This is so beautiful! I have so many gift ideas after looking at this Etsy shop. this is lovely work! I love this style of necklace. These look gorgeous and versatile. I absolutely adore the hand stamped necklace-camera necklace! So beautiful! I love personalized jewelry and i can tell your creations are made with love and care! 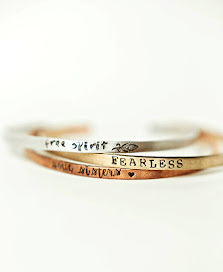 I love hand stamped art work....I love your items so much...ciao4now64 at yahoo cot com. Sooooo gorgeous! Thank-you for the awesome giveaway.